The Marvelous developed action RPG God Eater 3 was released in Japan at the end of last year on PlayStation 4 and PC. Since then, fans of the Bandai Namco published series have been wondering if the latest title will be making the Switch anytime soon, as past entries have been closely associated with portable devices. 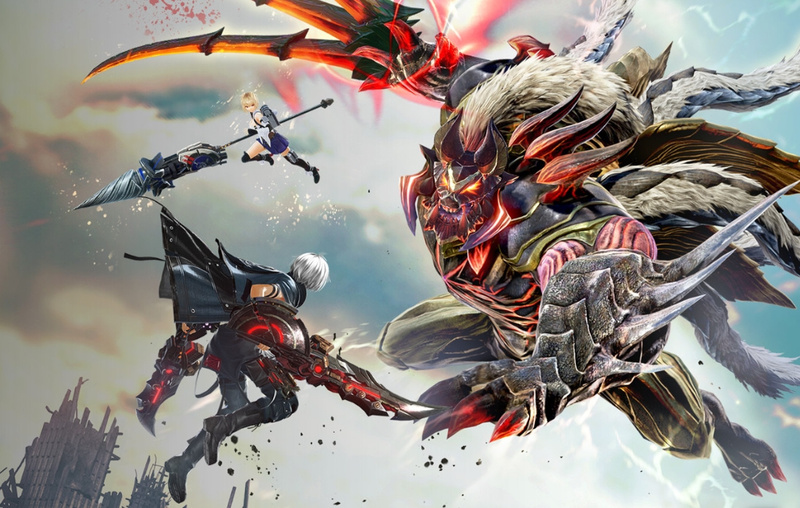 With Sony not interested in re-entering the portable market anytime soon, you would think the Switch is the prime candidate to host a future portable God Eater game. Bandai Namco has also had tremendous success on Nintendo's hybrid device so far, with games such as Dragon Ball FighterZ. Is this a game and series you would like to see make its way to the Switch? Tell us below. ...but seriously. Switch is already the dominant console in the Japanese market, and has supported big Japanese games with excellent sales on Switch, producing numbers that outpace those of other platforms such as Dragon Quest Builders 2. It simply makes no sense to leave the question of Switch support up to "fan demand" alone. Perhaps that excuse would have worked in 2017, but with Switch completely dominating every single week's Media Create chart, there's simply no reason for it. Come on already, Bandai. Even though the anime was badly butchered by delays and irregular release schedules, it did get me interested in the franchise. I wish they would redo it with a more competent studio and ditch the CG. I imagine the CG was chosen to make it feel more like a game, but... no. I honest to God have no idea what this game is about. I always look forward to more games for Nintendo Switch though. I have 1 and 2 on Vita and they’re amazing, high quality games. I tried god eater 1 in ps4, but I lost interest pretty fast. I'm actually pretty disappointed that they favored upping the quality just to skip the Switch. I don't have time to boot up a PC to play games all the time and I'm not about to buy a PS4 just to play one game. @Dpullam from my understanding based on friends’ descriptions, it’s similar to Monster Hunter but faster paced and more focus on story. Very anime too. Honestly can't say I'm familiar with this one. I've seen the anime and wasn't particularly impressed. But the idea of fighting monsters with weird monster-punk swords seems interesting for a game. Enough so for me to check out some gameplay. @ShadJV That is a pretty accurate description. Eh, tried the series on PS4 and really just thought it was inferior to Monster Hunter and I wasn't a fan of the anime art style. I've heard 3 is pretty different though so maybe I'll check it out if it comes to Switch. Maybe. I dare believe God Eater 3 is one of those "just a matter of time" ports. It's a Monster Hunter inspired game with animesque graphics and heavier emphasis on JRPG vibes (including a plot and actual characters), and the whole series historically DEBUTED on portables. If Sony had a more powerful Vita successor by now, you bet PS4 and PC would have been afterthoughts for the game in question. Let them take their time, I'm still on early Resurrection missions anyway. But like I've said before, this series and Toukiden (of which I, too, already have Kiwami on Vita) interest me more a wee bit more than Monster Hunter itself does. @Wanjia there are many of us, especially at the post-graduate full employment age. This is a big part of why portable gaming platforms remain an enduring success (especially when they endure commercial hardships by a 3DS scenario rather than a Vita one) and why numerous devs and publishers are interested in ports. But it's not done overnight either, and God Eater 3 is most likely one of the many recent games which were well into development by late 2016. Seems to me the Switch is a natural fit for "upgrading the quality" and "play off TV"
I honestly have mixed feelings about this. I am a fan of the series. Played GE1 on PSP, then GE2 and GER (re-relase of GE1) on PS Vita. And now, when GE3 is almost out they mention a "possibility" for GE3 on Switch, while I already preordered it for PS4. I would strongly prefer to play on switch and if they announced the game earlier, I'd be ready to wait longer to get portability. But now, I don't know if i'd rebuy it. I've seen the anime and it was alright, my impression was that it's a mix of Attack on Titan (the humans are behind a wall protecting them from the monsters) and Monster Hunter. All that with its own twist so that it stands by itself. I mean, I like Diablo 3 style of item system and level up and other similar simple systems. I just don't get why they make it so much complicated like it was in God Eater 2. The third one seems a bit different, focused on more action rather than spending hours in menus. I might give it a go if it comes and gets good reviews. Its Bandai Namco. Im sure theyll be asking us to beg soon given their support ia incredibly schizophrenic. Sure, bring it to Switch! I never pulled the trigger in this series. I am interested in it though. Yes sure. I just started playing Xenoblade Chronicles 2 anyway... And it will leave no time for other games for a while. I've been watching the trend. And the trend is "stuff that's usually non-Nintendo-only is coming to Switch". I guess this E3 is gonna be "it", a point of no return: we either get a crapton of third-party support (of further third-party support), or we're getting none. I see no middle ground at this point. I never could get into God Eater. I tried multiple times, but it just felt way overly complicated and the combat wasn't much fun. Maybe if things are streamlined a bit for the third entry, I'd be willing to try it, wherever it lands. They sold fine on VITA. So do not see why not. More excited about Monster Hunter World: Iceborne either way. They need to bring up the quality. I am one of those people they talked about however I never ask for God Eater though, I just want a new Tales RPG or in the case of Marvelous a sequel or remastered to Arc Rise Fantasia with better voice works. @retro_player_22 The good news is that a new Tales RPG has been confirmed to be in development, and given that the explicit purpose of Vesperia Definitive Edition was to make the Tales series fully multiplatform, I'd be surprised if the new game doesn't come to Switch. @ilikeike I hope to see one later this year or the following year, I was very disappointed that some of other promising Tales games like Tales of Innocence R and Tales of Destiny 2 (the real one, not Eternia) never made it to NA. Even worst is that Namco brought in the worst version of Tales of Phantasia (GBA) to NA while leaving the better version (PSP) in Japan. @Wanjia You most likely have your OS installed to a non-SSD. On SSD, Windows 10 will take like 30 seconds to boot, or instantly if you have it in sleep mode. @yuwarite Or I just don't have time for PC gaming. Working 45+ hours a week has shifted my priorities. I run two SSD; however, I value my time after work. I do not want to worry about whether or not my controller plugged in, headphones charged, mouse charged, etc. I used to do all that, now I just see it as a chore. @Wanjia For situations like that, I just have my gaming PC connected via my Shield TV, and play the games from the living room TV. The nice thing about PC gaming is the options of how you wish to play. @yuwarite I have a Steam Link*, which I've never been able to sustain a reasonable latency. However, you still need to boot up the computer wherever that's located. @Wanjia You would have it connected via Ethernet. Your boot up situation is very anecdotal, it literally takes seconds to boot my PC. But I generally keep mine on sleep, and SteamLink/GameStream will automatically wake the PC when the game is started; and can also put it to sleep again from Steam big picture. @yuwarite My PC is connected via Ethernet, which I've tried with multiple computers and all have latency issues. I'm really not trying to troubleshoot it anymore though. My view is that it's cumbersome and that's not going to change because I've had a negative experience. Maybe new firmware or a steam update has improved the experience, but trying to get it functioning properly just isn't worth my effort anymore. I'm glad that you've had a positive experience with game streaming and hopefully that could be normalized in the future. @Wanjia It's not your PC alone that has to be connected by Ethernet, but the Steam Link as well. You shouldn't be noticing any visible lag after that. Only in the most fast paced twitch games, played with a mouse may you notice some miliseconds in delay, but for anything played with a gamepad, it's perfectly fine. But I'm using an nVidia Shield, which is considered much better for local game streaming than a Steam Link; it even supports up to 4k60 with HDR, unlike the Steam Link. So my experience might be quite different from yours. @yuwarite Your experience may be different than mine, my experience falls in line with the 182 very bad reviews on Amazon, vs. the 1127 very good, which I could just as easily be one of the 9% negative reviews of the shield if I had selected that device instead. It doesn't matter what one person has because everyone will experience it differently. You run the gamut of having a negative experience any time you buy something - I have oil mister that has mostly positive reviews with a 10% negative rate due to short lifespans, yet mine is still going for 2 years. Does that mean all those negative experiences are wrong? No, I means that I just had a more favorable experience. Cut your losses and assume that I have no desire to troubleshoot my device anymore because it is tucked in a drawer for when the day I FEEL like trying it again, not because someone on the internet wants to tell me how great in-home steaming is and tell me I'm using it wrong after following the directions and the FAQs, which everytime someone from the internet decides that they need to troubleshoot it for me just pushes me one step closer to throwing the thing out. @Wanjia I'm just trying to provide you with a means to play God Eater 3. You seemingly appeared to own a gaming PC and didn't want to buy a PS4 for the game, so I was trying to help a fellow PC gamer out. But if that's how you want to be, then fine.